Work at your own pace through the lessons and lab exercises. 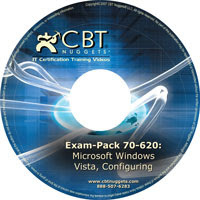 Focusing on configuring a Windows Vista client, this official study guide covers topics such as installing the client software, migrating from previous versions of the Microsoft Windows® client, and configuring systems settings, security features, network connectivity, communications and media applications, and mobile devices. It comes packed with the tools and features that exam candidates want most–including in-depth, self-paced training based on final exam content; rigorous, objective-by-objective review; exam tips from expert, exam-certified authors; and customizable testing options. It also provides real-world scenarios, case study examples, and troubleshooting labs for skills and expertise that you can apply to the job. plz kindly post the latest version of Pass4sure dumps 70-620.